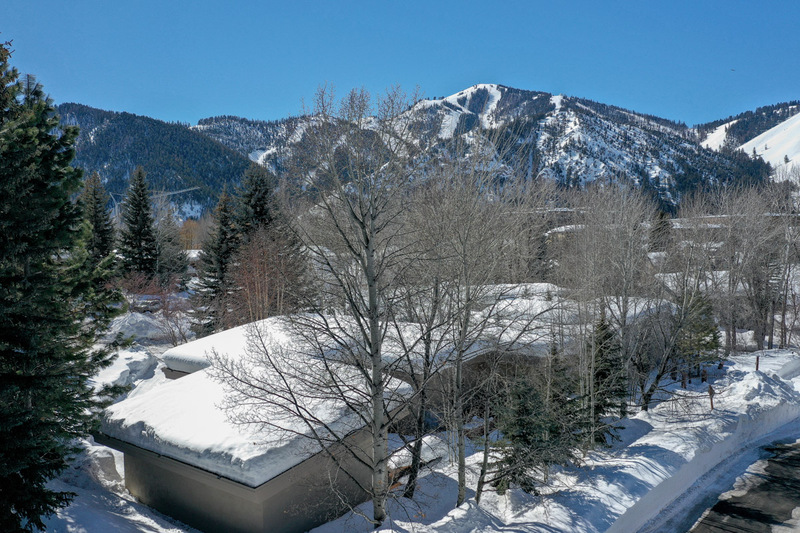 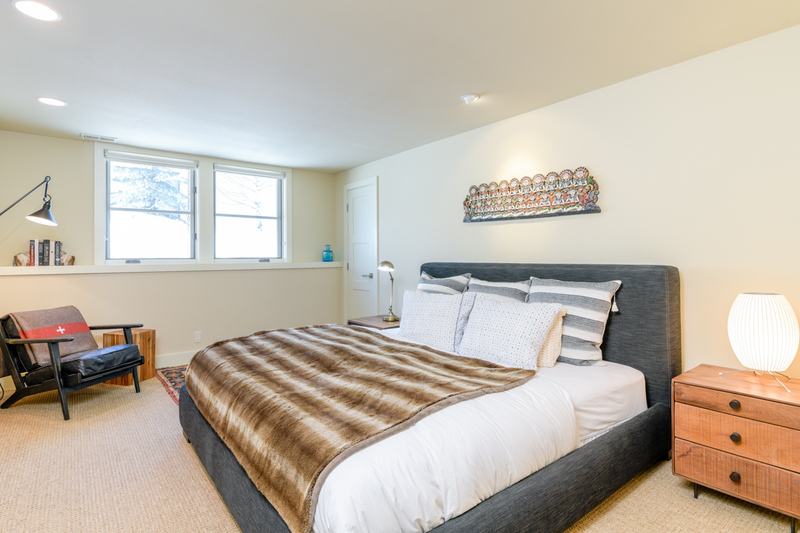 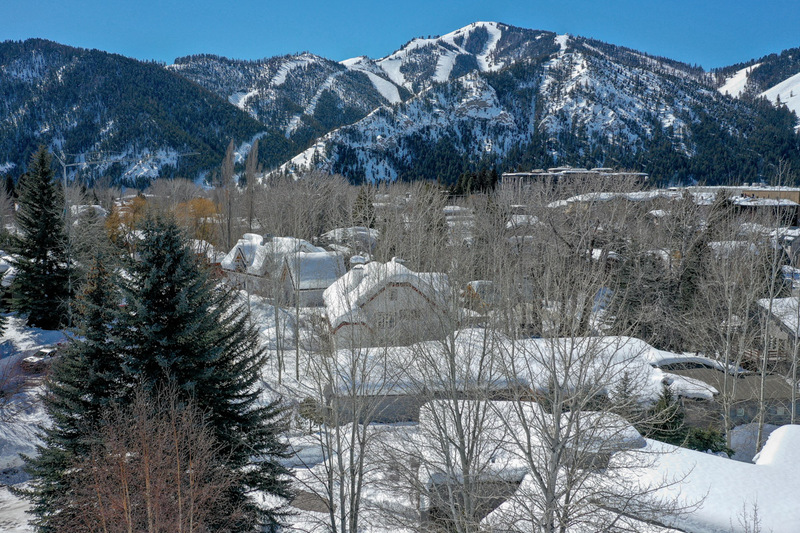 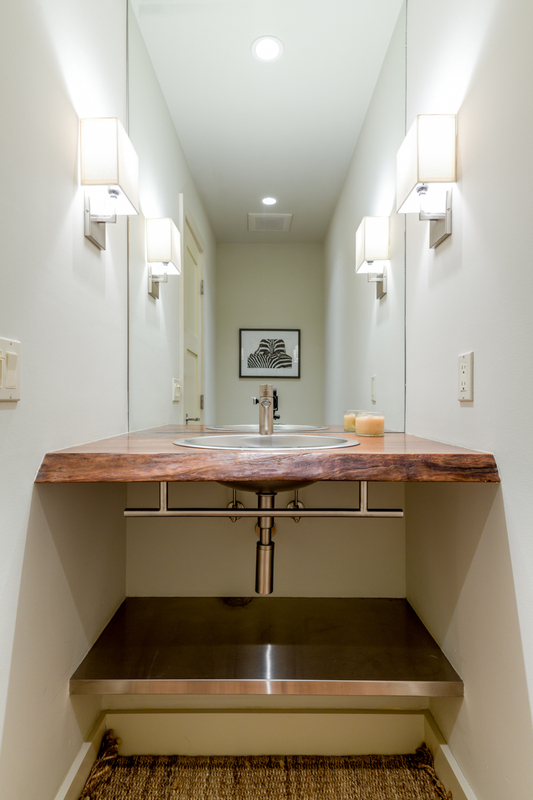 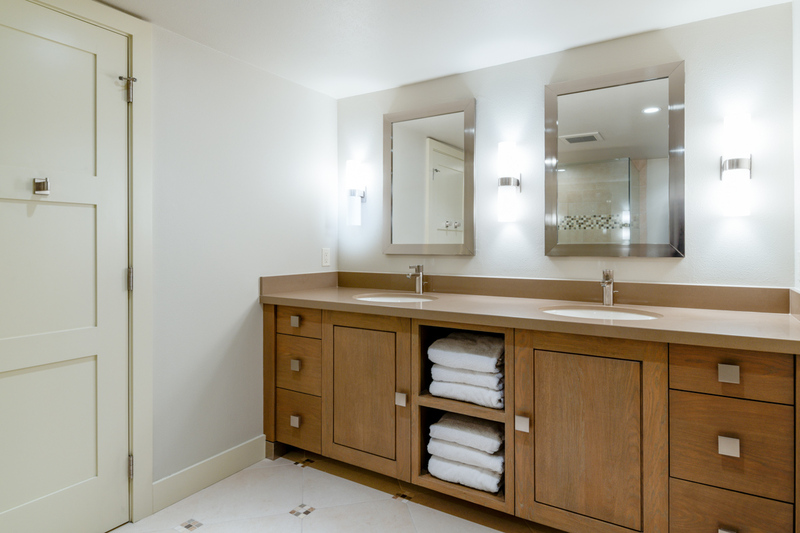 With sweeping views of Bald Mountain and a convenient location in the heart of downtown Ketchum, Onyx Haus offers a stylish mountain retreat with easy access with a 5 minute walk over the charming Trail Creek bridge to restaurants, shops, nightlife and the free town shuttle for skiing at River Run Lodge. 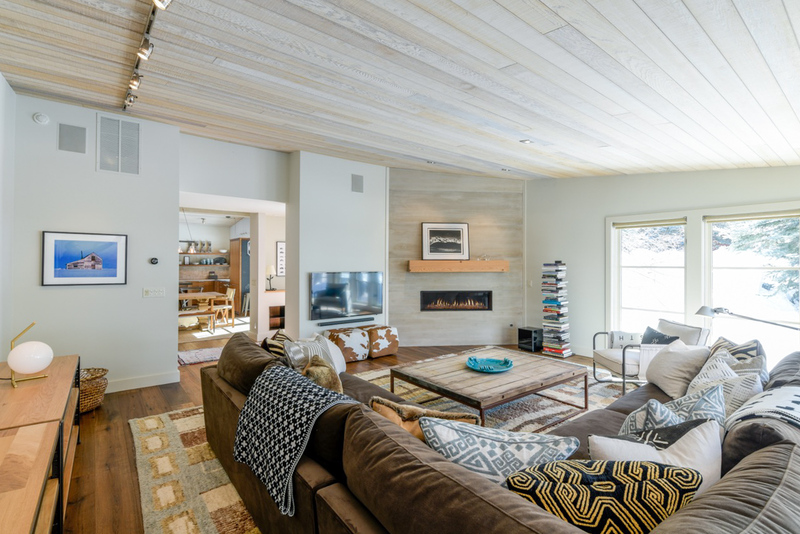 The 3-bedroom, 2.5-bath home opens onto a mountain modern great room with hardwood floors, a unique wood-paneled ceiling and a window wall revealing wooded grounds outside. 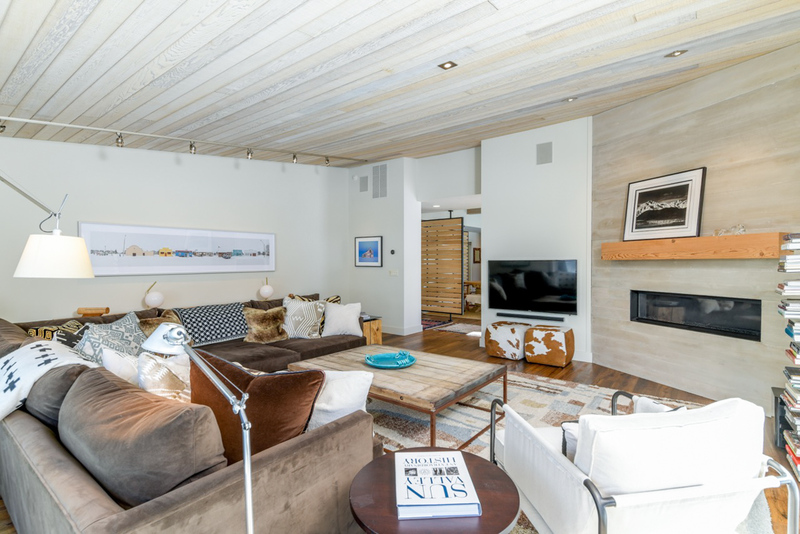 A comfy wrap-around sofa frames an antique coffee table opposite a large flat-screen TV, Sonos sound system through out upstairs living area and modern gas fireplace. 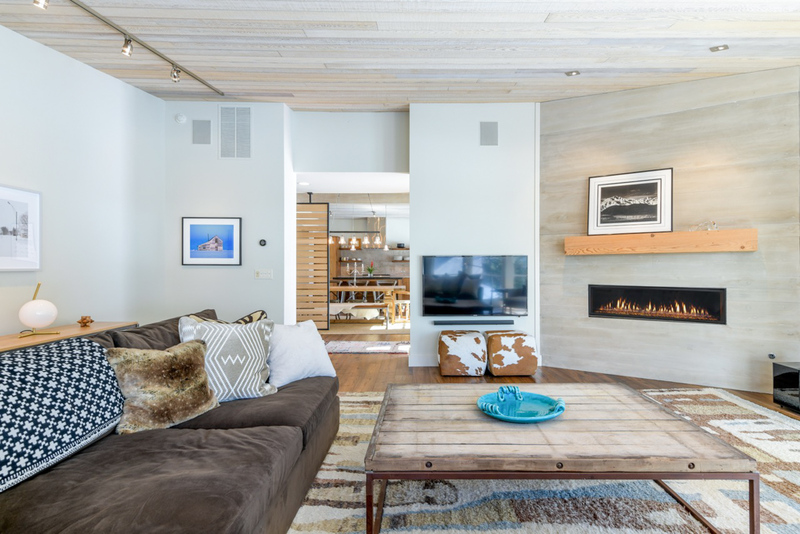 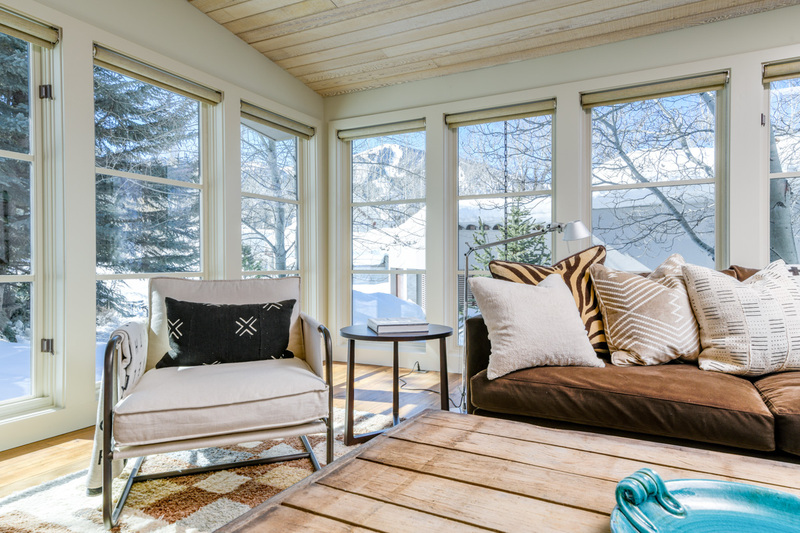 Mountain modern style accents, from patterned throw pillows to animal-print ottoman chairs, add a sense of whimsy. 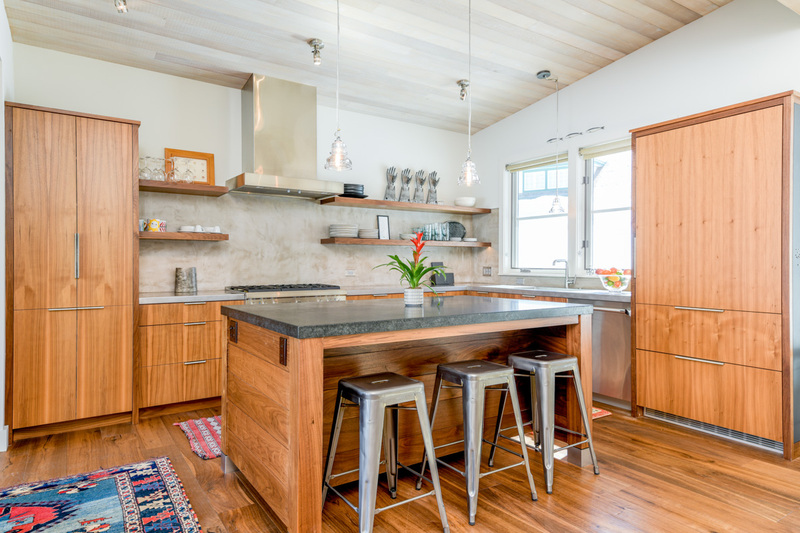 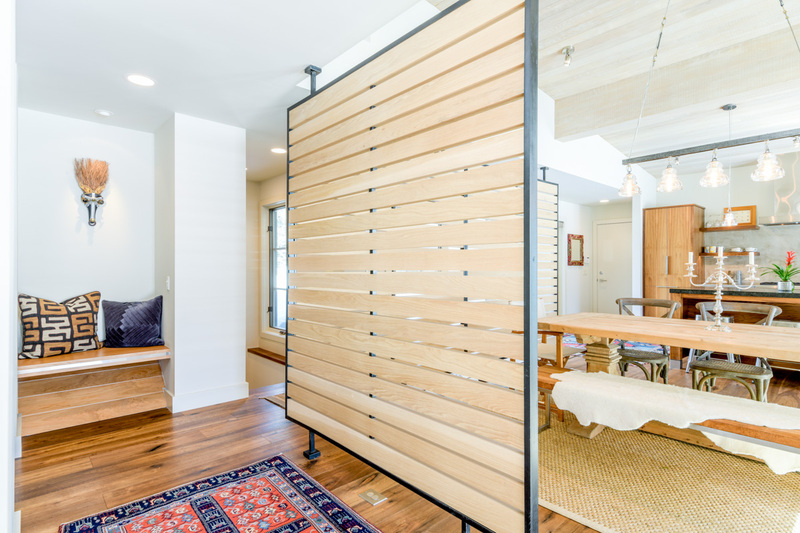 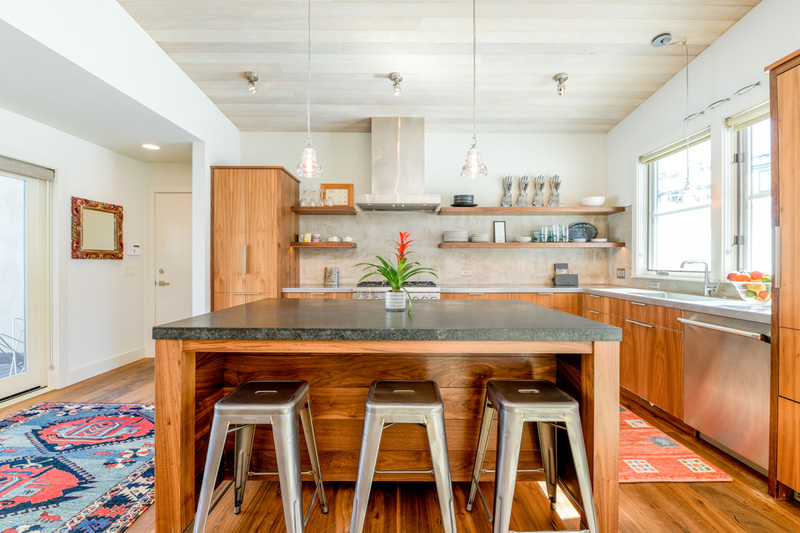 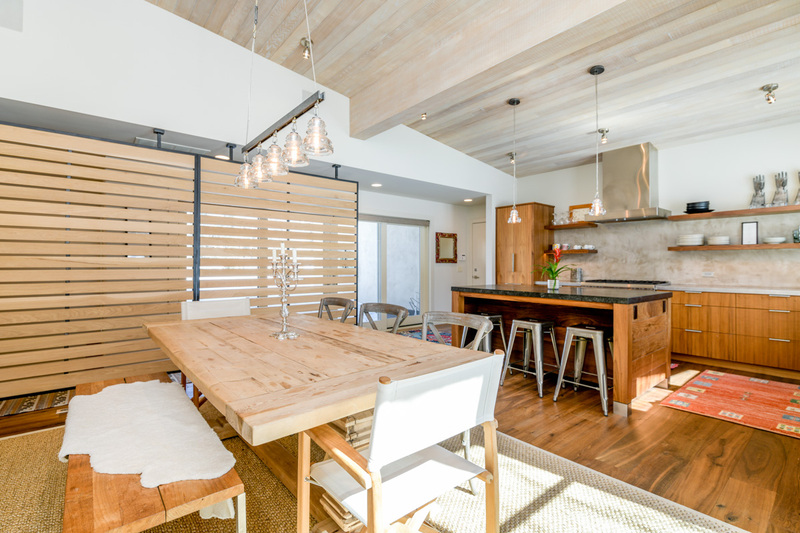 In the next room, a formal dining area welcomes up to 8 guests at a handcrafted dining table with a cozy bench and eclectic seats combining mountain modern and industrial accents. 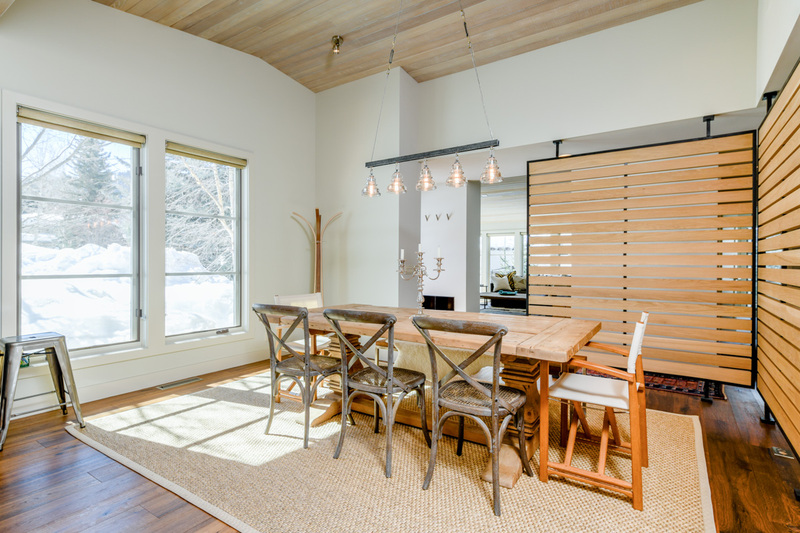 A modern chandelier hangs overhead. 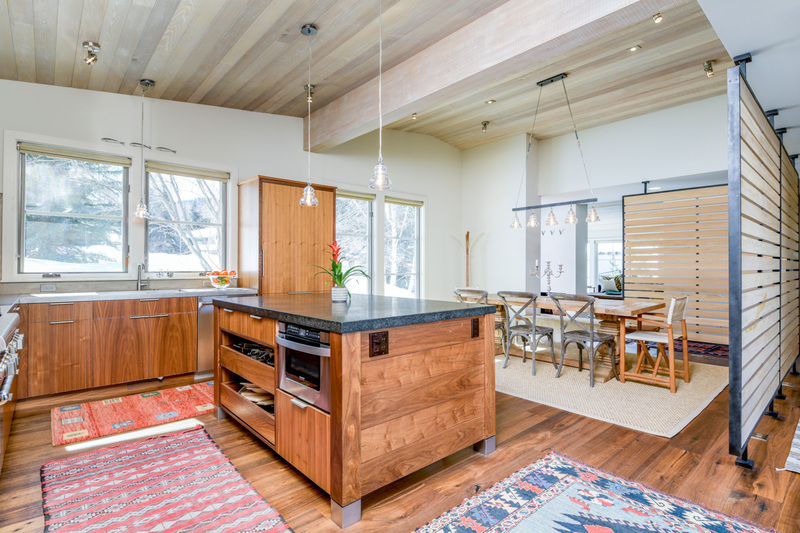 The dining area flows into an open, fully stocked gourmet kitchen that has everything including a Vitamix blender, Nespresso coffee maker, fondue pot, stainless steel appliances and high-end finishes, where three industrial-style stools provide additional seating at the breakfast bar. 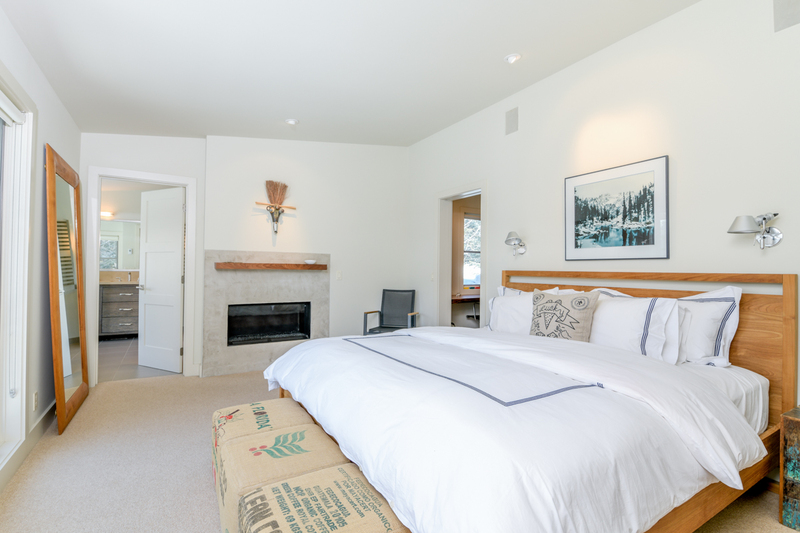 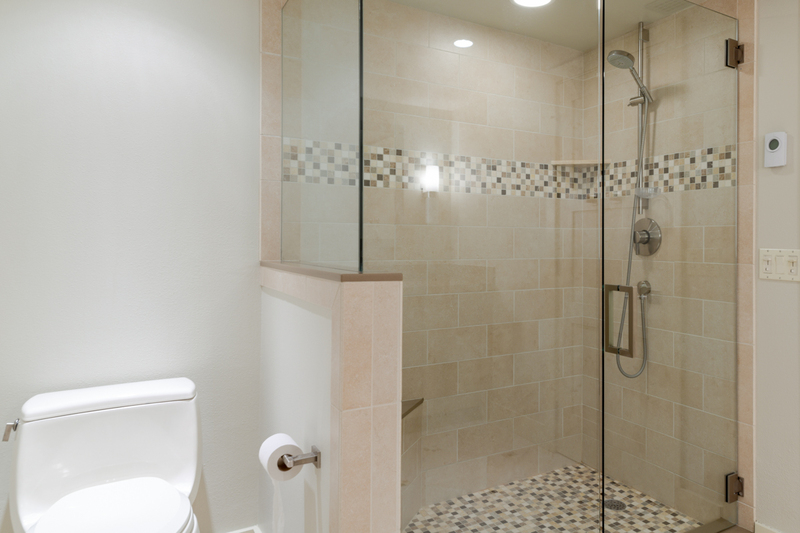 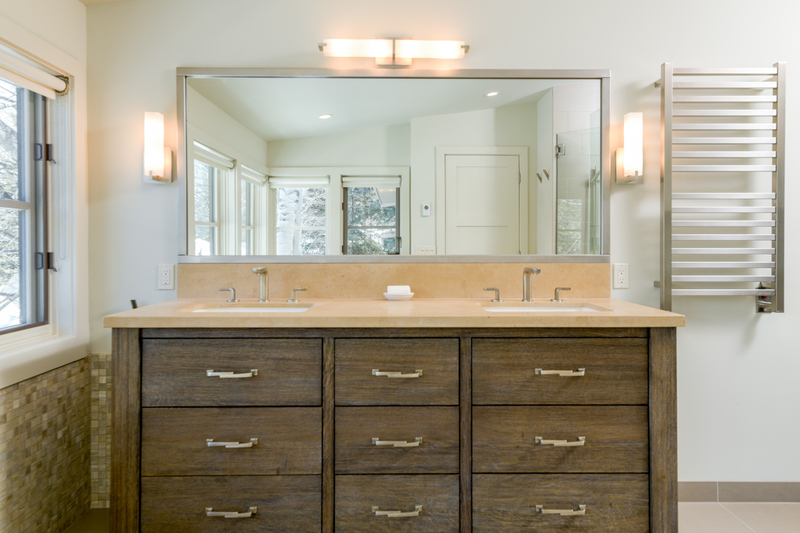 Down the hall is the master suite, styled in classic white decor with local photography and accents. 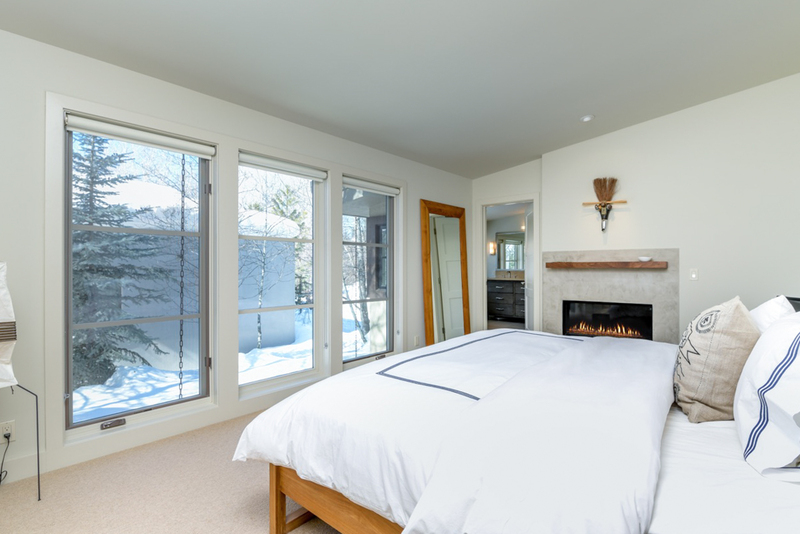 This room features a king-sized bed with European goose down duvets and pillows facing floor-to-ceiling windows, a gas fireplace and luxurious en-suite bath. 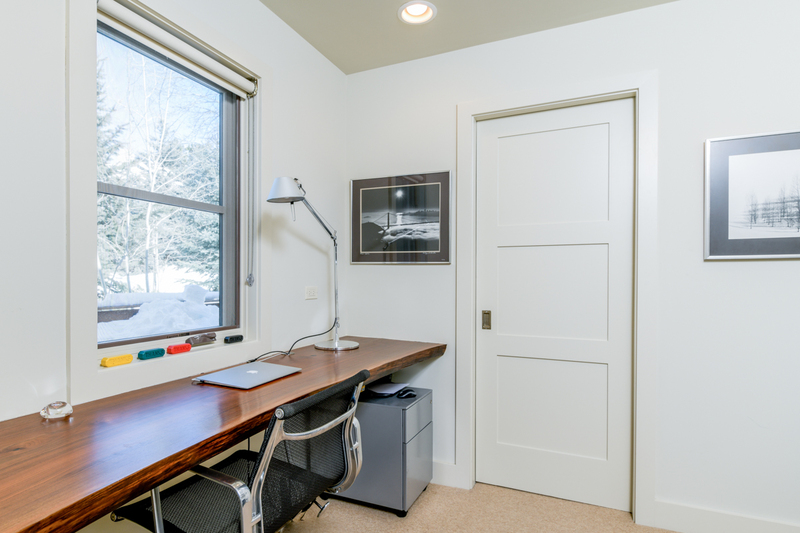 Just off the master is a separate office area with a picture window overlooking the wooded grounds. 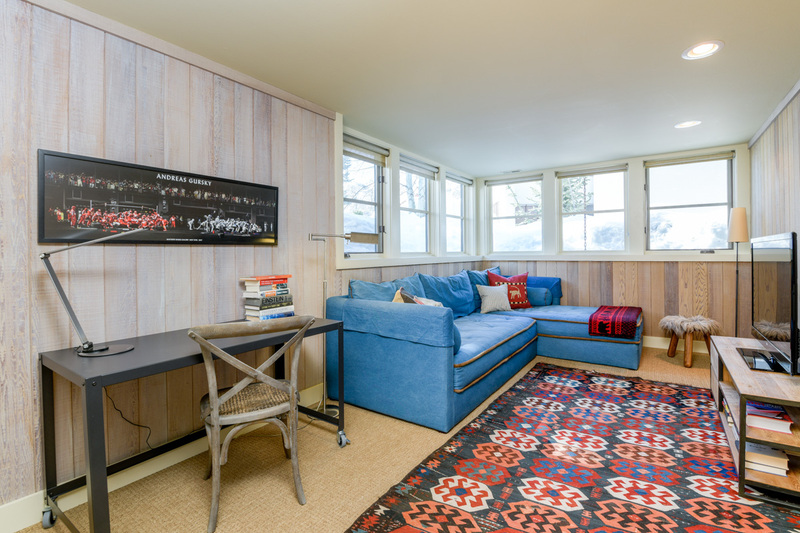 The second bedroom, styled in modern decor with a king-sized bed and leather mid-century style accent chair, is located on the lower level. 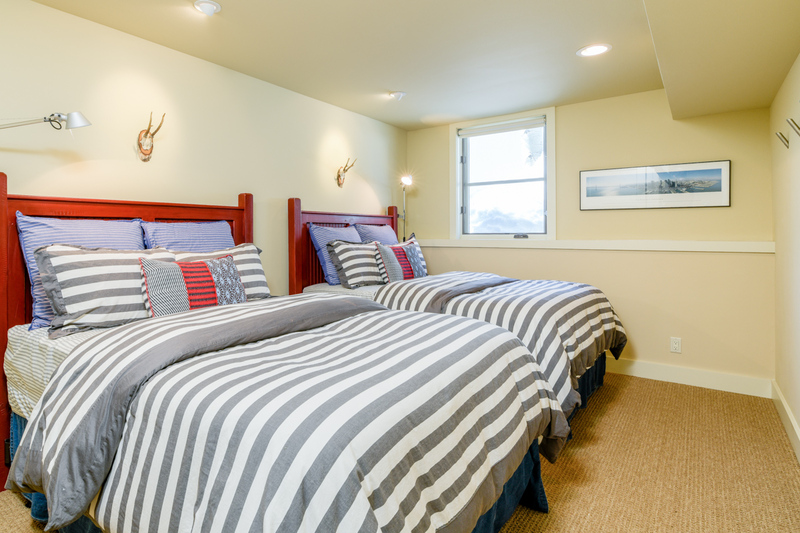 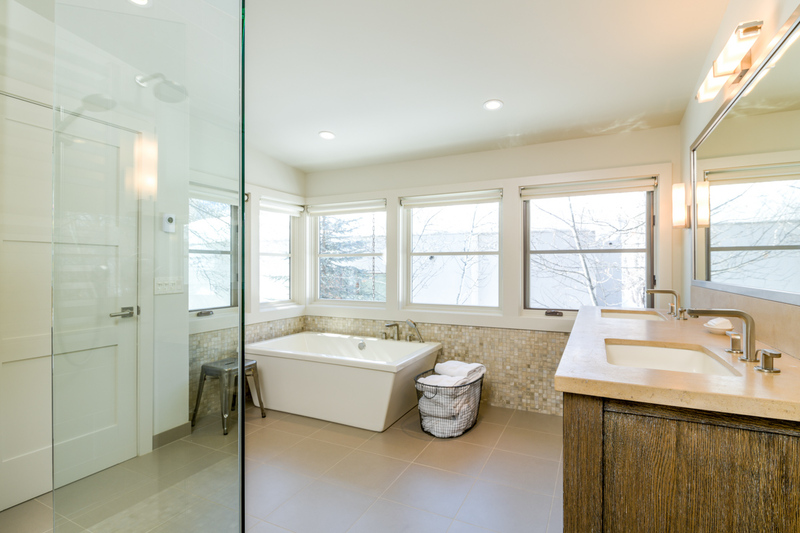 This room shares a bath with the third bedroom, which features two double beds that would be perfect for children and teens. 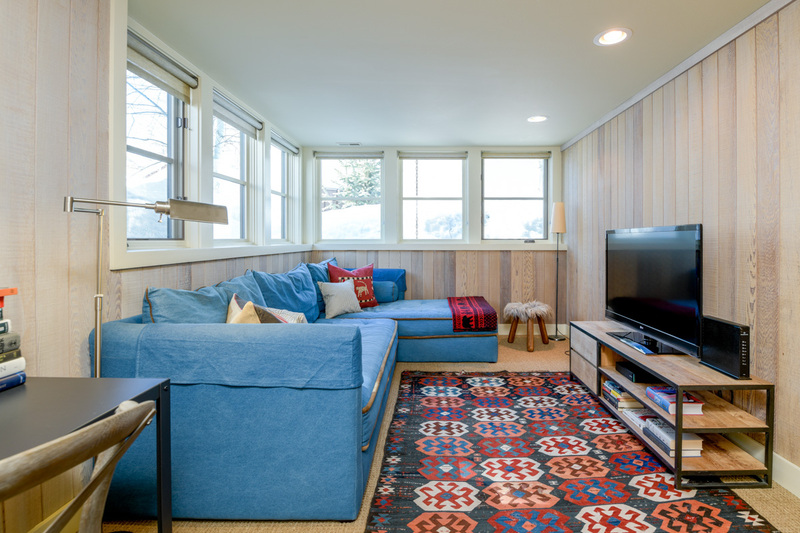 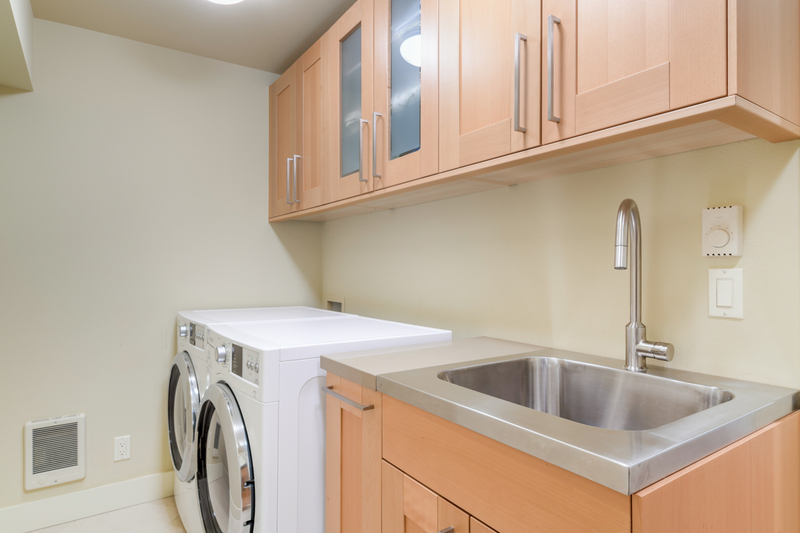 The lower level also features a private laundry room and a spacious den with sectional couch, office area and large-screen TV. 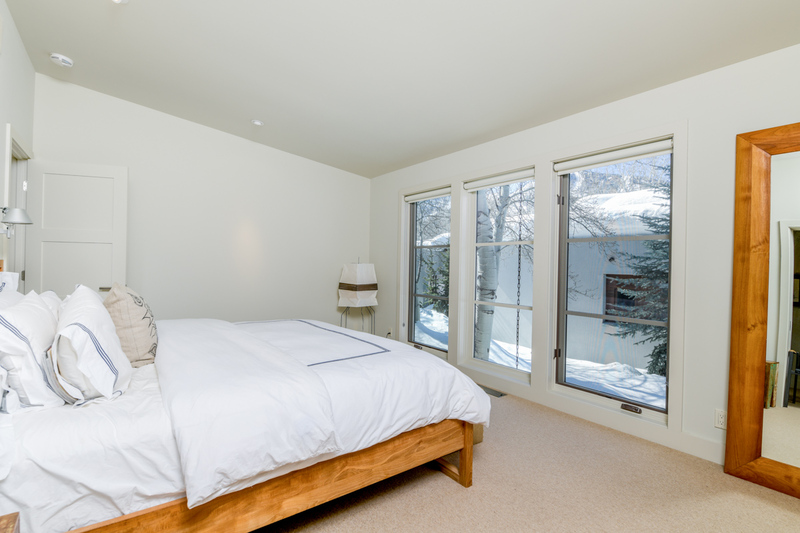 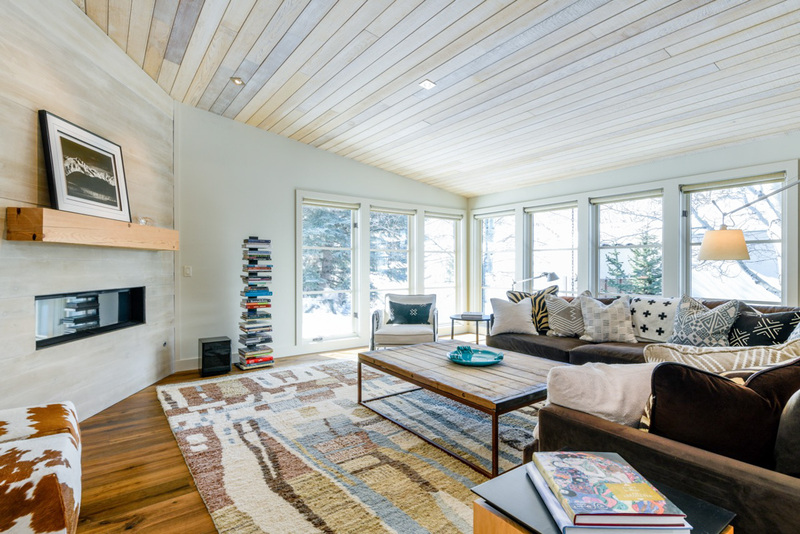 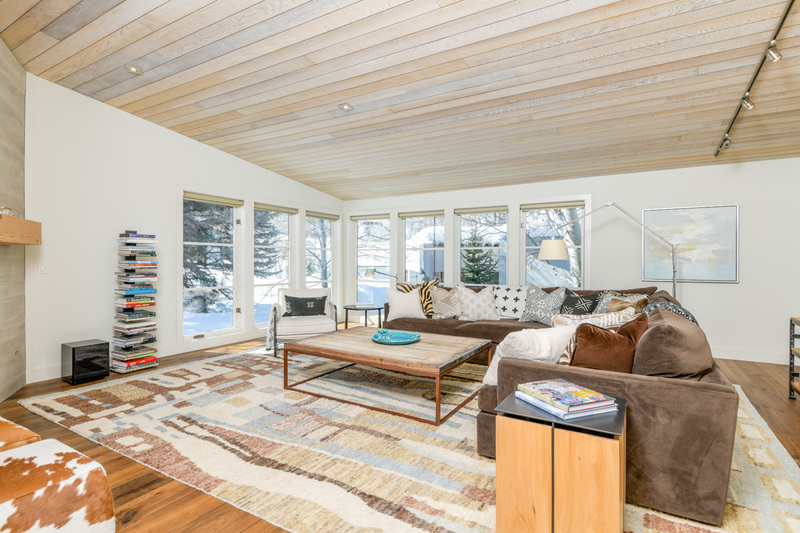 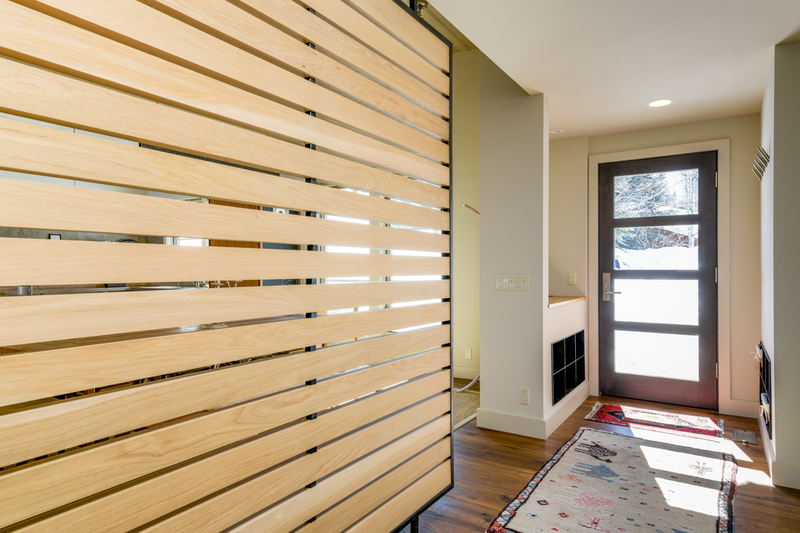 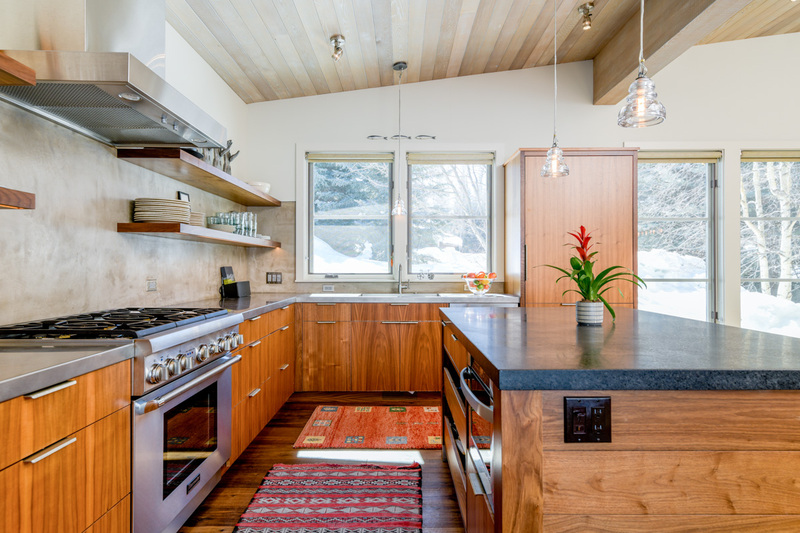 Surrounded by tall aspen trees and evergreens, Onyx Haus offers a feeling of total privacy and seclusion with the convenience of downtown Ketchum a short walk away. 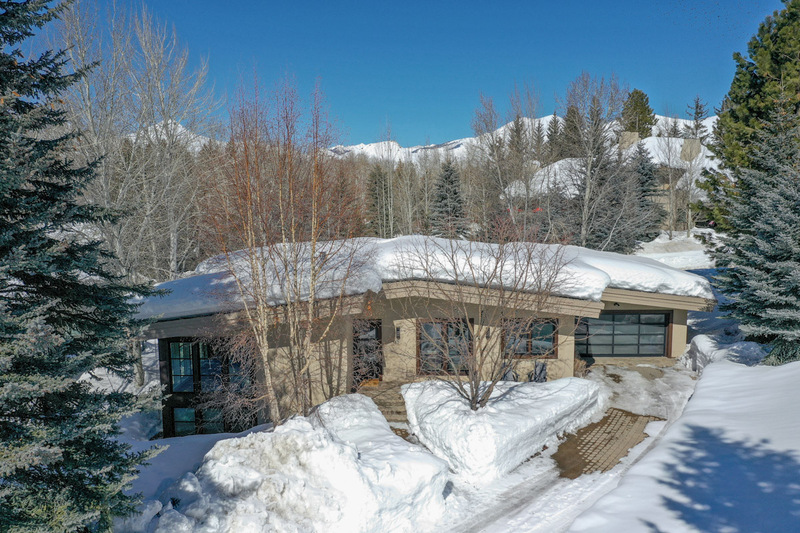 A spacious deck off the living area offers a private hot tub, relaxing deck furniture, and a BBQ grill for apres-ski al fresco, while an additional seating area in front offers clear views of Bald Mountain. 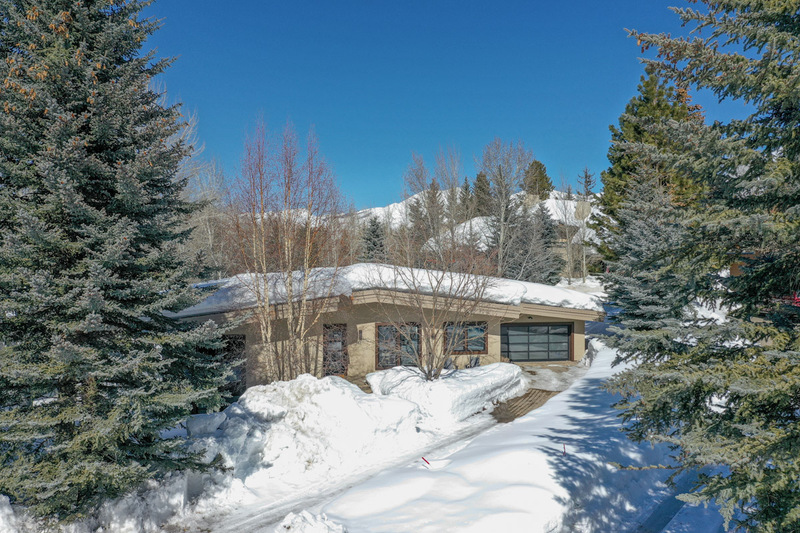 This home also features a garage with room for one car and additional parking room in the driveway to explore year-round adventures surrounding Sun Valley, from sport shooting to horseback riding.